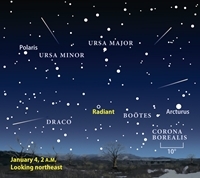 The meteor shower of January 3, 2011 is expected to be the best meteor show of 2011. One interesting fact according to my research, before a great awakening there were incredible meteor showers. This show is expected to be about 120 meteors per hour (aka ‘shooting stars’). The normal is 6-10 per hour on a typical night. The meteor shower of November 13, 1833, before a spiritual awakening was recorded so thick, as extensive, so long lasting, that thousands feared the planet was doomed, ‘the whole firmament, over all the United States, being then, for [eight] hours in fiery commotion’… Meteor showers of 60,000 per hour Astronomers predict that the Quadrantids will peak around 8 p.m. EST January 3. That time works best for Europe, but North American meteor-watchers should also keep an eye out because predicting meteor showers isn’t an exact science yet. New Moon occurs at 4:03 a.m. EST January 4, so no distracting moonlight will pollute the sky. Meteoroid is a rock in space from an asteroid or comet orbiting the sun. 2011 will be nothing to compare to that, but will be fun to see. Those in the southern areas need only to recline in their lawn chairs and watch the show (if you are away from city lights). No binoculars or telescope are needed and you won’t have to wait up for it. Peak Central time should be 7pm.